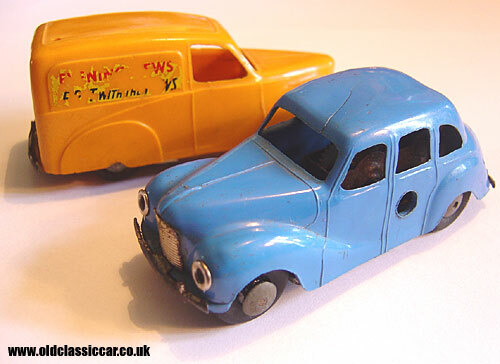 A pair of Tri-ang Minic toy Austins. 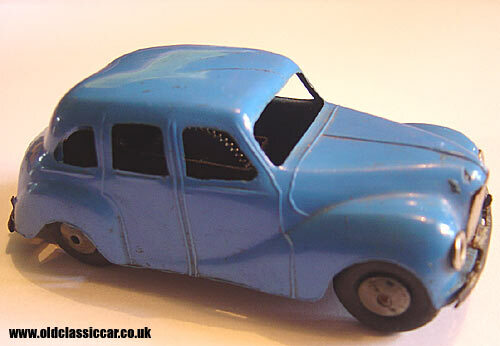 Two toy Austin A40 Devons. Tri-ang were one of the most prolific of all British toy manufacturers in the 40s and 50s, right up there with Dinky and Corgi in the toy-buyer's consciousness. The two toy A40s shown here are both Tri-angs, with plastic bodies and tin bases housing a clockwork mechanism. Both toys measure approximately 3.5ins in length. Both are part of the 'Minic Toys' set of vehicles, a line that can trace its roots way back, with the superb all-tinplate cars and lorries that preceeded the two offerings shown here. Firstly the blue car, based on the four door Austin A40 Devon saloon, a vehicle that I am somewhat familiar with (my A40). This one was found on ebay in 2008, and is in reasonable condition, with just a faint split to the roof letting the side down. The nearside rear door has an aperture in it, through which the key could be placed to wind up the mechanism. Although not mint, it is a fairly scarce toy, and I'm very happy with it. The real car was produced at the Austin factory in Longbridge from 1947 through to 1952, making way for the dumpy A40 Somerset. The commercial variants of the A40 continued for some more years - this range included a pickup, and a van. 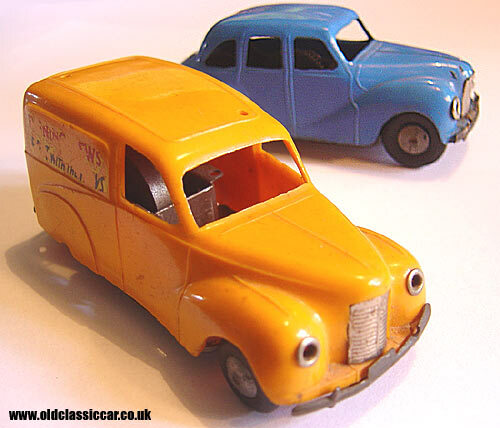 The yellow van is based on the Austin A40 10cwt panel van of the 1950s, and uses a totally different moulding to the toy car. Instead of having a wind-up motor, the van has a friction drive system. This example is missing a sign on the roof, and the lettering has worn away on both sides. I included it here to allow comparison with the Tri-ang Minic saloon.